When Laser 558 went on the air in 1984 an audience of several million soon grew over a short period of a few months, resulting in dwindling audience figures for ILR stations in the South East. Collectively, the stations campaigned for something to be done and together with the IBA, they funded the Department of Trade and Industry to instigate a blockade and surveillance of the offshore stations in order to starve them off the air by restricting supply vessels and prosecuting individuals who assisted Laser or Caroline. 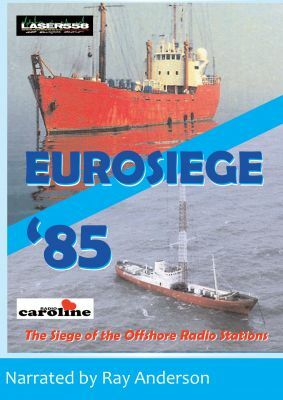 Our video crew visited both Laser 558 and Radio Caroline during the siege to make this report, we also visited a DTI press conference to obtain the reasons behind the blockade given by leading DTI officials. Also including footage of the Laser 558 ship 'm.v. Communicator' as she arrives in Harwich harbour. Featured are Johnny Lewis, Peter Philips, Charlie Wolf, Chris Carson, Tommy Rivers and Jonell.